Ann Wright asked about Rex after one of my recent posts, so I thought I'd give a little update on our new pet. We thought he was going to die for a few days. He wouldn't open his eyes, wouldn't eat and was just acting odd. Then two days ago he started shedding his skin. I'm not sure if that had to do with how he was acting or not, but he perked up after his skin sloughed off. We keep him in our window all the time now. I put a new branch in there every day, and spray the branch with water a few times a day because I read that they won't drink out of a container, but drink off of leaves. It is so funny watching him drink off the leaves. He is eating much better too - flies, moths, crickets. One of these days I'll get a video clip of him eating an insect...his tongue is pretty long! I've done a lot to keep this little guy alive, but not for my benefit. I was just thinking about how sad it would be for Drew to lose his new pet. He has wanted one for so long, So, for now it looks like we will be able to keep him. Things are getting pretty dry around here. Our poor garden is starting to dry up. Ben took the girls for a walk today and snapped some pictures of nature. In the process he got our pathetic farm. I am so ready for rain...I never thought the skies would dry up after all the rain we got. So odd. The dust has settled some, but it is like we are in the middle of the dry season again. Pray...pray for rain. Our day was normal as usual. I had ladies Bible study at 4. I came home and we ate a delish meal of Italian Beef sandwiches. My sister-in-law gave me the yummy recipe. They were so good! I had to crock-pot the meat for nearly 24 hours for it to be tender enough, but once it was done...it just fell apart. Our beef here is pretty tough. All the cows walk to the meat market, so there isn't too much fat on them and they end up being really tough. I recently bought a meat tenderizer, and between that and cooking the meat so long, it worked perfectly! Now it is late...and Wii are tired and headed to bed! G'night! Palm Sunday is pretty cool here in Cameroon. Everyone carries Palm branches to church to celebrate the day. Unfortunately I didn't think to get any pictures of it...boo on me. Another event that I should have gotten some pictures of today is our Bambili "Chop and Talk"...those two words are pidgin for food and fellowship or talking. We do this about 4 times a year and everyone brings food and we have a meal after church. It is a lot of fun and a great way for our family to eat some African food. Today Kate was chowing down on a fish tail...Mmmmm (not!) She is definitely my most adventurous when it comes to trying unique and new foods. She eats almost any African dish you hand her. I love that girl!! This afternoon I spent most of my time cleaning the kitchen that I'd completely made a mess of while trying to prepare food for church this morning. The kids had a blast playing outside...at least Drew and Kate did. Emma and Faith took a desperately needed nap. 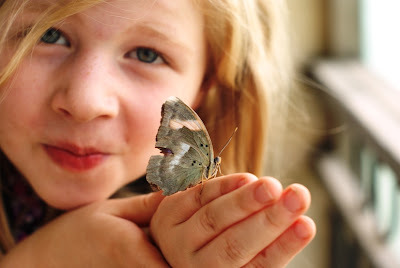 Somehow a butterfly got trapped on our front porch and the kids had so much fun playing with it. It kept landing on them...they were so excited. I'm so excited about my new oven!! I can't even tell you what a blessing this thing will be. Ben bought it when he went to Douala to pick up Lee, but we haven't had a chance until today to move the old one out and the new one in. Isn't it a beaut!! The burners on top are basically the same as my old one...I had six before and I have 6 now. But the oven itself is over twice the size of my old one!! I can fit two 9x13 pans and another small casserole dish on the top rack itself! It has a roasting pan and it also has a rotisserie feature. I can skewer a chicken and it will rotate at the touch of a button. I just can't tell you how excited I am. It has a few glitches...but none that will cause huge problems. The whole oven is gas (you can see the rusty orange gas bottle to the right of it), but it has some electric features. It has an interior light, the rotisserie runs on electricity, and it has an electric starter. Well, we started the burners fine, but have yet to start the oven. So, I'm going to need to get one of those candle lighters for my oven. Kind of a pain, but I'll deal. 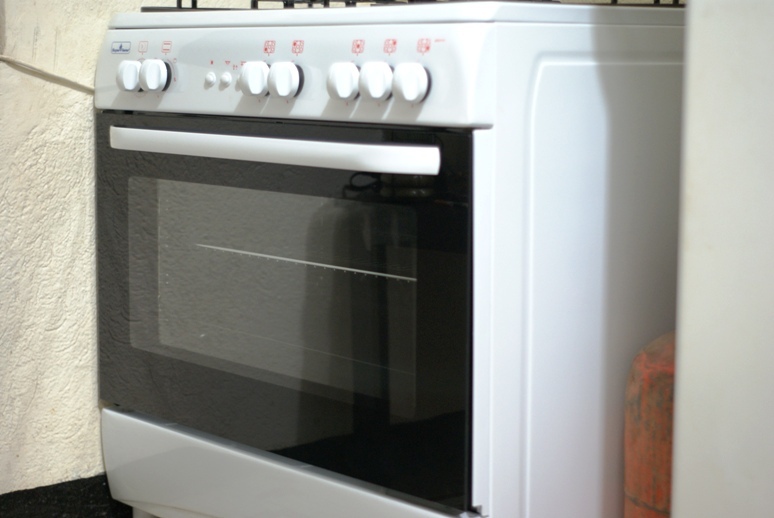 The reason we got this is because we are hosting a lot more visitors and my old oven was so small and really difficult at times when cooking large amounts of food for large amounts of people. We hosted a family of 7 last term, so that was 13 of us eating. We hosted 7 adults this past year - again 13 of us eating, and this coming summer we are hosting a big church group, so having a bigger oven will be a bigger blessing and help to me...the chef! Still no rain...keep praying! :) and here is a super cool website to check out the rainfall in Africa. 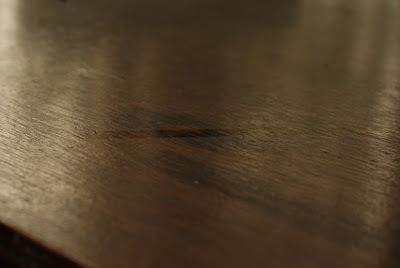 When you see dark brown, you can tell that is where it is raining at that moment. I think the satellite for this site takes a new photo every hour, so I keep this website open a lot and keep refreshing throughout the day. Right now there is absolutely nothing over Cameroon...all blue. Check out Wikipedia here to see what Cameroon looks like and where Bamenda is located. I was afraid that Rex wasn't going to be with us much longer today. Starting yesterday he was refusing to eat and he wouldn't even open his eyes. 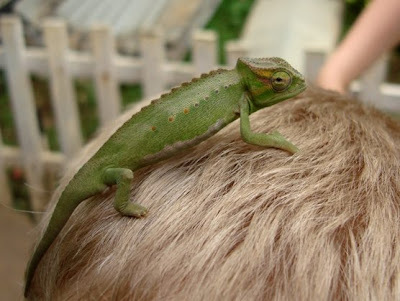 I started doing some research on chameleons and we were doing a lot of wrong things in taking care of him. He needs sunlight which he wasn't getting enough of. They don't like to be handled a lot and are stressed easily, so you should hold them as little as possible. They need water, but won't drink it out of a dish. They are used to drinking it off of leaves. So, we made some major changes today. We have huge floor to ceiling windows all around our parlor. They have screens on them and in the afternoon a lot of sunlight floods those windows. So, I stuck a big tall branch that I'd cut off of a big bush, into that window and put Rex inside it and closed all the glass panes. He had plenty of climbing space and leaves to hide under. Then I went around and caught flies in a little tupperware container and I kept releasing them in there and shutting the window. I know for sure that he ate 2 and possibly more. I was so glad to see him eating again. He really enjoyed the sunshine today and when it started getting cool I put him back in his bucket and put fresh foliage in there and sprinkled a bunch of water in there so he could get some liquid. So...hopefully we did enough to keep him alive and if he survives til tomorrow...we will do it all over again! 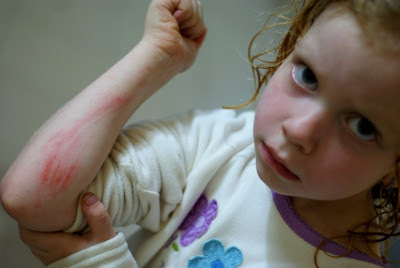 Poor Emma fell down and scraped her arm today...doesn't she look pitiful? Obviously she is fine, but sometimes scrapes hurt worse than deep cuts, so I knew it hurt pretty badly. I ushered her straight to the bath tub and bathed her because it looked like she'd tried to slide into home base. Turns out she was just playing chronicles of narnia and fell. Ben had a very interesting experience on his way home. Since we didn't have a date night this week, we decided we'd do it tonight. I asked him to get a coke on the way out of town. Well, he'd already left town and ended up picking it up at 4 corners Bambui. It was just sitting on the shelf there and happened to be the last one. He set it in the passenger seat beside him and it was inside a plastic sack. Suddenly he heard a BOOM and was covered in a spray of Coca Cola! 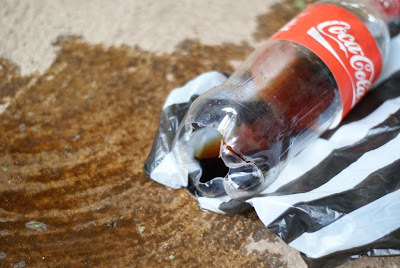 That thing blew up...literally blew a hole out the bottom of the bottle and the plastic bag it was in. Unreal!! Has anyone ever heard of that happening before? Other odd things have happened before with coke here. A few times I've opened a bottle and the cap has shot out of my hand to the ceiling. Like somehow it is under too much pressure or something. Weird! I'm always thankful that my face wasn't over the bottle. I could have easily lost an eye! Here is a picture of the after affects. I was trying to come up with fairly easy meal for lunch, so that when Ben and Lee came home from their counseling class it would be ready and good and filling. 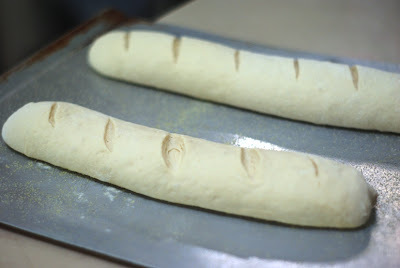 Sandwiches seemed to be the best choice, but I didn't have bread on hand, so thankfully I thought of it early enough and threw together this yummy crusty french bread. The picture I took is of the bread before it's second rise. When it was all said and done it was nice and big and fluffy...and yummy I might add. The kids made a big deal about how great it was so I think I need to make it more often. And with the beauty of the bread machine I didn't need to do a stitch of kneading...just rolled it out when the machine finished working it's magic! Well, back to my mouse saga...We finally caught number 5! We'd seen him 2 days ago, but hadn't caught him. This morning Kate announced that he was stuck! Yay!! What a relief that is. Hopefully there are no more! And back to my dry season saga...We still have dust everywhere and no rain in sight. People were asking prayer for the weather situation at church tonight. They don't want their crops to suffer. 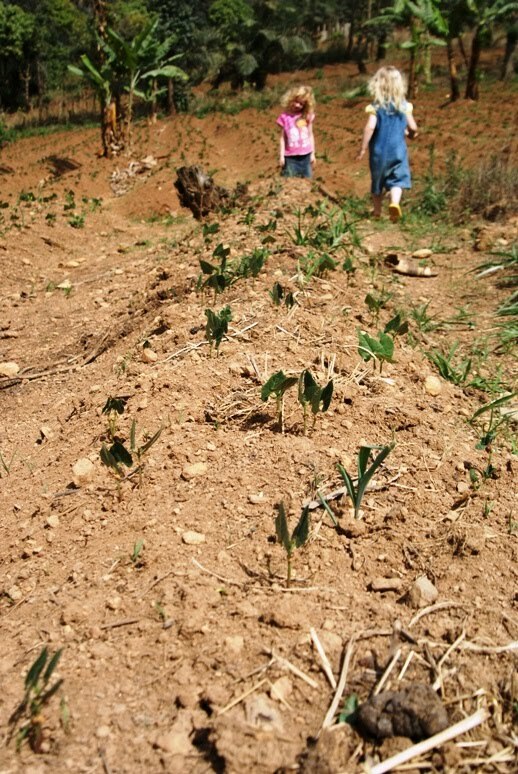 It will be a big expense if people have to replant and many can't afford it. Our nightwatchmen said they have about a month. If it doesn't rain within a month they will have to replant, but Lord willing it will rain before that and everything will be ok.
Back to our water saga...no water for the last two nights. I was spoiled by my showers and suddenly get grumpy when I can't take them! I need to keep reminding myself that I need to be "content in whatsoever state I am" like the Apostle Paul was. Drew is studying the life of Abraham Lincoln in his Heritage Studies right now. He recently wrote a report about him and did a great job of it too. Today he made a hat (or I made it). 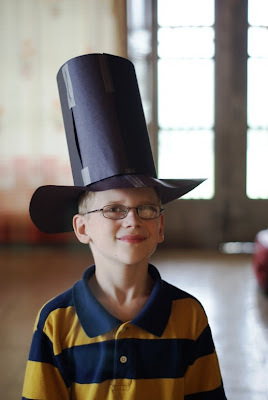 It didn't turn out all that great...looks more like a Halloween costume than Abraham Lincoln's hat, but Drew was pretty excited about it. Recently Ben has been searching for famous quotes of former presidents. There are some good ones, but one of my favorites of Abraham Lincoln's is, "If I were two-faced...would I be wearing this one?" Haha! He was obviously known for being rather homely. Our day was fairly normal...busy with school, cleaning. The house was mopped today...and already a layer of dust has settled. Tomorrow will be one week without rain. I hope it rains soon. I'm beyond ready for it. The kids continue to enjoy Rex and we go searching for flies every day to fatten him up. He didn't fare as well today as yesterday. As soon as the rains fall, all sorts of creatures will come out of the woodwork. Oh, and still no sighting of the 5th mouse. Maybe it snuck outside while the door was open. Yeah, I'm sure it is wishful thinking on my part...but you never know! Look at these crazy kids...trying to get them to look at the camera all at the same time, and in a semi-sane fashion, is nearly impossible. I wanted to give Grandma a glimpse of how much fun her gifts for the kids are! 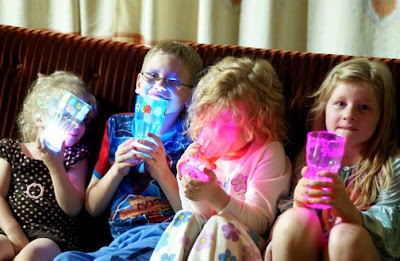 She sent these cups with Lee that have lights in the bottom and at the touch of the button they sparkle and flash all different colors. The kids like to put different drinks in them to see what they will look like. We've tried coke, different colors of kool-aid and juices. Each time it brings an ooh and an ahh! :) Thanks so much Grandma...the kids LOVE their cups! My day started really early as I woke up sick. Not sure what that was all about...but thankfully by the time my stomach had emptied and I got a few hours sleep I felt better. Ben told the kids to be quiet "Because mommy was sick in the night." I actually woke up before 8, and went out of my bedroom. I saw that Ben was still there so quickly ducked back in the room. He came in the room a moment later and I asked him why he wasn't gone yet...I knew he'd be late for their first class. "Well...we've had a bit of a delay this morning." I was like "what?" His response was "Number 5." GREAT...I knew what that meant. We have a 5th mouse! Only this time he didn't catch it! Ahhhh!!! I kept my eyes peeled all day...and especially during our devotions. He didn't show. I read online that mice can have anywhere from 2-20 in their litter. That was NOT encouraging AT all. We have never had this many mice at one time. Three was the tops and that was during our last term. This is actually the first mice problem since we have been back this term. Crazy! The kids did great in school. We had fun feeding Rex. We found him a big fat fly. I wasn't sure he could eat it, but he did. It took him about 5 minutes, but he got it down. I told the kids that they couldn't touch Rex today at all. During one of their breaks this morning they decided it would be fun to play hide and seek...with the chameleon that is. So, Kate stuck it in our garden and walked away. Then I heard yelling and crying. Drew was SO upset b/c they couldn't find it. I was like, "Duh...what do you expect! He is made to blend in!" I went out there searching. 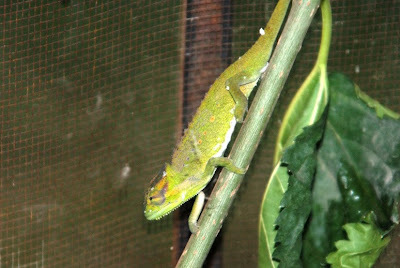 Thankfully chameleons don't move very fast and I found him in a couple of minutes. We have had wonderful, wonderful water again for the past two nights. I'm already looking forward to a shower. I'll wait until my load of laundry is finished though! :) Goodnight!! Would you believe we caught another mouse tonight!? This one wasn't quite as spiritual as the others because he waited until long after family devotions was over to make his prescence known. Unreal...we obviously have a serious problem here. Thankfully these little guys are young and dumb and fairly easy to catch. I just hope they stay young and bold before they get too big to get sneaky! What I really hope is that we caught the last one. We have one sticky pad left. We have used it twice now and keep recycling it! Ben just scrapes the mouse into a bucket of water...you can figure the rest out. We put the paper cover back on the sticky pad in case we need it again. Today was pretty busy for Ben and our guest Pastor Lee Atkinson. Ben and Lee have been friends since about their freshman year in High School. So, this is a neat experience for him to come over here and see our ministry. Lee taught a Biblical Counseling course from 8 a.m. til noon. Then he went back at 3 and taught til 5. I bet he is beat! He is doing this through Thursday. Here is a shot of him teaching. Notice how they decorated for him? :) I was busy in the house washing a ton of dishes. I try to do dishes once a day b/c of our water situation. We got water two nights in a row but didn't get any last night. Since I never really know when we will get water and when we won't, I am just really careful to conserve in whatever way possible. Plus, I hate doing dishes, so once is enough for me! haha! I was also busy supervising the kids in school. Ben and Lee came home around 1. I made Lee something for lunch and our family went to our restaurant. Lee really wanted to stay home while it was quiet and do some studying, so it worked out well. We brought along our new pet, Rex. Last week there were SO many flies while we ate lunch, that I figured it would be a great way for the chameleon to get a decent meal. We sit down to eat and there are NO flies! Unbelievable! When you don't want them, they are there, and when you do want them, they aren't! We did manage to find a few and the kids enjoyed taking him on our little family date! We got back home and the men hopped back in the car and went up to Sabga for more classes. I laid down and rested. I can tell I'm overtired when everything starts to wear on me emotionally...the water, the dust, the lack of rain... In fact I need to head to bed right now b/c I really need a good night sleep. Tomorrow will be more of the same (hopefully no more mice!) but the men won't come home for lunch, so it will be me and the kiddos till dinner! Have a great night! What a busy day! It started pretty early. I got up at 6:30 and went straight to the kitchen and started peeling potatoes for our food and fellowship in Bamenda today. I had planned to just keep them in chunks and stir some kind of seasoning into them, but ended up cooking them too long and so I mashed them and stirred in lots of butter and salt. People kind of looked at it funny, but my flask got cleaned out, so I guess they liked it ok.
Lee Atkinson (our guest) preached a missions message from the book of II Kings in the Old Testament. It was such a great message. I think the only missions message I've ever heard from the Old Testament is the classic from Isaiah. It was so great and full of wonderful application. I know the people enjoyed it too. After the preaching we ate our meal. We ended up leaving the church at around 3, and headed straight to the Bamenda General hospital. A couple in our church had a baby on Saturday, so we wanted to go and congratulate them. We were there quite a while...the kids had fun oohing and ahhing over the baby, who was so cute and so alert! I wouldn't allow them to touch him b/c they were filthy! By the time we got home, it was 5 o'clock! We had some trouble makers at our house while we were gone. Someone stole the padlock from our gate. The Pa who watches our house couldn't explain really well what happened. Thankfully nothing else was taken. I hope your Sunday was as wonderful as ours! Of course I don't hope you have mice in your house, but all mice aside, we are truly priviledged to live here in Cameroon. We rarely have a dull moment. Our lives are full of excitement and full of blessings from the Lord! Sorry for not posting yesterday...No excuses really, just was too busy to be on the computer much. Yesterday was an odd day. It was busy with people. Our landlady was here doing work, and the men were here putting finishing touches on the roof project. People were coming to buy all the old zinc from our roof top. I was just in and out all day. Ben was gone, so I was by myself. He was on his way to Douala to pick up Pastor Lee Atkinson who is visiting us for a week. One odd part of the day was the cloud that seemed to envelop our house. I didn't think too much of it, until I woke up this morning and my house was COVERED in dust. It was in the air! I could taste it! We could see our footprints as we walked across our tiled floors. I was baffled all morning...rainy season is here and this dust (also called Harmatan...dust from the Sahara desert) is only supposed to come in the dry season. 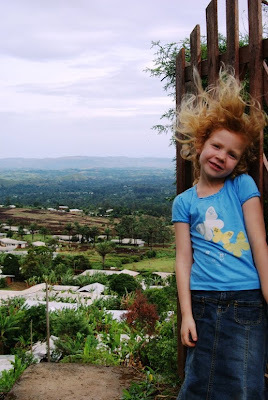 This picture is taken in the exact same spot that Emma stood with wind blown hair only 3 days before. Unbelievable! 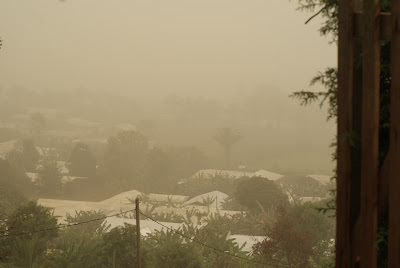 We can barely see past our yard...where days before we could see all the way to Bamenda! So odd...and a little depressing! I'm so ready for rainy season...this Harmatan is a real setback! So anyway...today (Sat.) was busy again cleaning. I kept wiping the table. I'd come back an hour later and run my finger across it and I'd see this: I finally gave up on the dust. It was a battle I wasn't going to win. I am praying rain will come again SOON and knock all this crazy dust out of the air. Ben came home to a clean, albeit dusty, house and hauled in FOUR packed suitcases just for us, stuffed full of goodies. Lee's church had fun, and my Mom and Ben's Mom had fun, buying tons of goodies for us and the kids. What fun it was going through it all! There were bags upon bags of pepperoni, cute pencils for the kids, cake mixes, TONS of candy, medicine, marshmallows, church materials, books and special treats. It would take me too long to list it all. Thanks SO much to everyone who participated in these gifts! What a blessing you were to us tonight! And one more blessing...we have water again!! I'm off to take another shower!! Goodnight! This morning I woke up to the sound of rushing wind. It was gloriously cool. I went outside and breathed in the fresh air. If I closed my eyes, I could imagine I was basking in an Autumn morning in the U.S. It was just so beautiful out. I could tell that even the kids were enjoying it. They kept asking to take breaks and go outside to play, which is rare for them. Especially for Drew. He is always very intent on getting school done and over with. I couldn't resist them because I wanted to be outside playing too! They spent a chunk of the morning running around with their sweat shirts on playing an imaginary game of Chronicles of Narnia. I enjoyed listening to them. I had all the windows open and the huge curtains were billowing in the breeze. Can I adequately express how thankful I am for rainy season?? I was thinking the other day how blessed we are here. Some countries in Africa suffer through drought. Most of the kids here in Cameroon have never experienced a drought. Diane, a friend of mine, is about 17 and she told me that her grandmother remembers a drought, but that was a long time ago. Anyway, this gorgeous weather was just a bright spot in my whole day! The kids did eventually finish school and played well this afternoon. They have vivid imaginations! 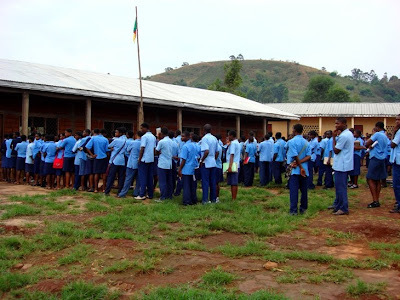 Ben left directly after lunch to run errands in town and for Bamenda's midweek service. People might wonder why I skip Wednesday church...haha! I guess I've never explained our routine for that. Our weeks are so busy and full that Susan and I divide up the midweek services. She and her family go on Wednesday for church in Bamenda. And our family goes to Bambili for the midweek service on Thursday. As the kids get older and are a little more independant in their school, we will probably be able to do both. But for now it is easiest this way. Here is my picture for the day. I wanted to give you a glimpse of how clear the skies are again and also of how windy it was today! All that gorgeous green is for all the Irish today celebrating Saint Patrick's day! It is amazing that just a few weeks ago all that landscape was a drab brown! Hope your day was as glorious as mine! When I know there is a mouse in my house, it puts me on edge. I just imagine anytime I open the cupboard or drawer the thing will jump out at me. I was disappointed when I got up this morning that the mouse traps we had set were empty. It appeared that the peanut butter hadn't been touched as well. That made me feel a little better. I HATE it when they clean the traps and don't get caught! So anyway, all day the idea of the mouse living with us was at the back of my mind. We went on with our normal routine. The kids worked on school. Ben worked on writing a paper. Around 4 p.m. I headed down to church for ladies Bible study. I ended up being the only one to show up today :( Not sure what happened. At 5 p.m. I came back home and Drew and I hung out in the kitchen listening to the Lion, the Witch and the Wardrobe tonight. He ate popcorn while I did dishes. 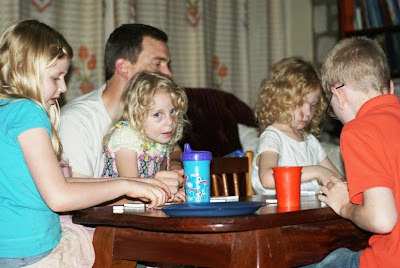 Then at 8 p.m. we all sat down to family devotions. In the middle of devos, Ben hopped up and went to the bookcase, shushing everyone. He thought he had seen movement over there. I thought he was imagining things. He sat back down and about a minute later, I squealed! There was movement over there!! So, for the next 20 minutes we played cat and mouse. That little thing was SO bold!! 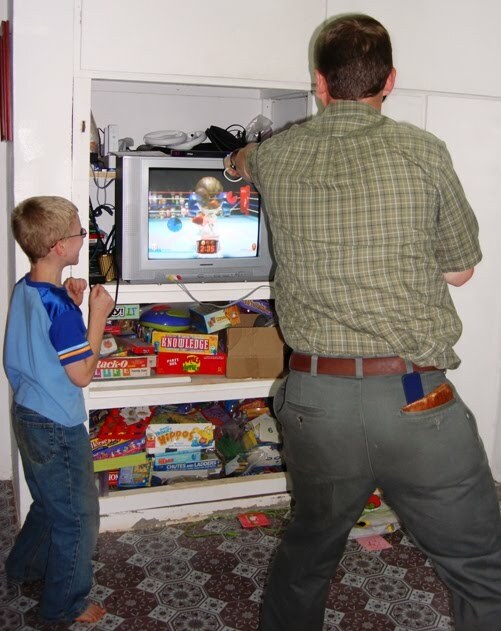 He kept running out from behind the bookcase, for all the family to see. We sat there debating what to do. I suggested putting the trap we'd set right along the wall next to the bookcase. So, that is what we did. 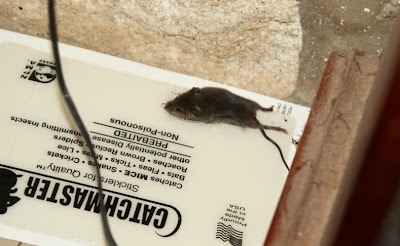 In less than a minute that tiny mouse was STANDING on the trap eating away the yummy peanut butter!! Ahhhhh!! No wonder the traps didn't get him. He's too small! So, I rushed out to our store room and dug out some of those old sticky boards. We set that up in place of the trap. As soon as we'd done that, the mouse ran out from the other side of the bookcase. Right in front of all of us...we were so close to him! He ran back in, and Ben tried to scare him to the other side. Finally he tried to sneak out of the side with the sticky board and he got stuck in a jiffy. He wasn't big enough or strong enough to pull himself off, so he was caught good. YAY!! Victory for the Sinclairs!! I will sleep SO much better tonight knowing that the mouse is caught! Right before devotions Ben asked me what picture I'd gotten for the day. I told him I was planning on taking a picture of the empty mouse trap to show we still didn't have our mouse. I'm so glad that I can share this picture instead!! Today was a full day. We got up early as a family and headed to Kedjum Kiku Secondary School (not sure of the exact spelling - but you say it like I spelled it). This is a picture of the students lined up outside while Ben is teaching them the story of Ruth. If you look closely you can see him holding up a picture flash card. The kids and I waited in the car right there watching everything. I really wanted to take a picture of all the late students. Sometimes they get whacked with a big stick, but probably because a white man woman (that is what I'm called) and my white man babies (all my kids) were watching, the discipline master didn't beat anyone today. All the late students did have to kneel down in the mud until the moral instruction was finished. After Ben taught, the discipline master wanted the entire family to come up in front of the students. He asked me to say a word. I didn't like that (I''m not a big public speaker) but I just greeted everyone, told them my name, and introduced the children. He seemed satisfied with that (whew!). From there we went to Mbingo Baptist Hospital. Ben got me all set up with Emma and Drew, gave me money for everything we needed and he headed to teach at MCC Mejong for their chapel. Emma, Drew and I stood around waiting for her tetanus booster. She was really pitiful. I could tell she was SO nervous about getting a shot. She asked me, "Mommy, is getting a shot worse than getting a spanking?" haha! I assured her no, it would be over much faster and was just a pinch. Kind of like getting her ears peirced. :) That seemed to make her feel a little better. She still was really nervous. The nurse finally called us into the room, and she just started crying these huge, pitiful silent tears. Oh man...even I got teary! I just felt so bad for her. Once she saw the needle, the silent tears turned into noisy tears. Not really...but she was scared. She hasn't had a shot in a while! So, I just told her not to look and it was over in a jiffy. I think she was surprised at how easy it was. She was prepared for the worst! From there we headed straight to the eye clinic. Drew did great. He hates the drops that dilate his eyes as they sting, but he was a trouper and after all was said and done, we learned that his pressure was increased again. Please pray that God would continue to control the pressure in his eyes, and that the combination of drops we use will work properly. We left there and went to our restaurant for burgers. We ate and went home and I crashed! I was tired. Emma and Faith took a nap too and Kate and Drew quietly watched a movie. Ben spent a good chunk of the afternoon sharing the gospel with a new neighbor of ours, Barnabas. In the evening all the kids sat around in the kitchen with me and we listened to a dramatized version of the Chronicles of Narnia. It is a focus on the family version and was really well done. The kids were mezmerized. So, I'm sure that will be a nightly routine for a while until we can finish the series! Our family devotions was turned upside down tonight. As we were sitting there working on our memory verse, we see a little baby mouse scurry along the wall of the parlor. EEeeeeeeKK! It was so small, I only got a glimpse and thought it was a big rainy season spider. I would have definitely preferred the spider! That thing vanished in thin air! We all sat staring at the wall on either side of the couch (it had run behind the couch) while Ben went to get our cat. We tore that couch apart figuring it HAD to be in there. Nothing. Patches did manage to catch a lizard though. Oh well...we will set traps and hope it gets caught!! I HATE mice in my house!!!!! There is an interesting story behind this mouse though. The other night Ben was outside talking to Michael and he watched Patches bring in a baby mouse....alive!! Evidently just to play with! Well, the mouse managed to elude Patches. Ben saw it again and tried to get patches to catch the thing and it eluded her once again. Somehow that little booger managed to get inside. It is obviously clever...avoiding death a few times already. I really hope we can catch it! Happy, Happy! This is how we greet people on Sunday here in Cameroon. Someone might shake my hand and say "happy Sunday" and I'll respond, "happy, happy!" Kind of funny, but you get the hang of it after a while. My children's church was full this morning. I know it isn't a ton of kids, but it was fuller than it normally is. Susan's was busting at the seams in Bamenda. She had 40 kids!! We don't have as many kids come in Bambili, but today was a great group and I had fun teaching them about David fleeing from King Saul. They were attentive and involved and I appreciated them answering questions. Sometimes the kids look at me like I'm an alien! lol! Bamenda was busting at the seams too. I think we had over 70 people there. Each week we memorize a scripture portion as a church. This weeks verse was II Cor. 12:9. It was tough, but a lot of people tried to say it at least. My kids really struggled to get the verse down this week. Drew was the only one who could quote it. Emma raised her hand and started it, but Ben just called out for her to sit down b/c we knew she couldn't quote it. A few minutes later I see Kate's hand shoot up. She was in the front and Ben and I were in the back. I just looked at Ben...I knew she couldn't quote the verse either. Well, she looks down at her lap and then starts quoting the verse word perfectly. It was a little odd though...she was talking kind of funny and I suddenly realized that She Was Reading It!!! That little stinker sat there while everyone else was quoting it and wrote it down on a scrap peice of paper! Wow! Primus said she was clever. I told her after church that she was a cheater! Just another lesson on the sin nature we passed down to our kids. I think our kid's sin nature mostly comes from the Sinclair genes though. (haha!! jk!) I don't think she will ever do that again! I was thankful to climb the hill back to Bambili. It is so much cooler here! We enjoyed a relaxing evening as a family and are about to head to bed. We are all heading to moral instruction classes with Ben tomorrow. After Ben teaches we head to Mbingo hospital. Drew has an eye appointment and we are going to get a tetanus shot (pronounced Tee-Tah-Noose here) for Emma. We had all the roof construction going on and on Saturday she happened to step on an old nail...probably about 33 years old...so I would rather be safe than sorry. It will be a pain to drag the whole family along, but I think we need to take care of it. I hope you all had a blessed Sunday as well!! Ben is so good about playing games with the kids. Tonight Emma came up and asked him if he'd be willing to play a game of dominoes. So, he gathered all the kids and they played several rounds. I'm not sure if Faith actually played...but she sure enjoyed sitting in Daddy's lap. They do love their Daddy, but I think they love their Mommy more (haha!) Faith made us laugh tonight. We have a system...there is an order of what kid sits where during our family devotions every night. They each take turns sitting with their Daddy in this order: Faith, Emma, Kate and Drew. Well, whoever sat with Daddy the night before gets to sit with Mommy next. So, tonight Faith came up to Ben and said, "Daddy, do I get to sit with you tonight?" Ben told her yes. She said, "Good! That means I sit with Mommy tomorrow night!!!" Clearly she is counting down the time until she sits with me. Drew sat with me tonight and actually he is my favorite because he plays with my hair and it puts me to sleep! The girls don't have the patience for that. They want to actually try and fix it and end up getting my hair in a zillion knots, so I usually just tell them not to touch. Today was rainy, breezy, and quite cool. Glorious in fact. 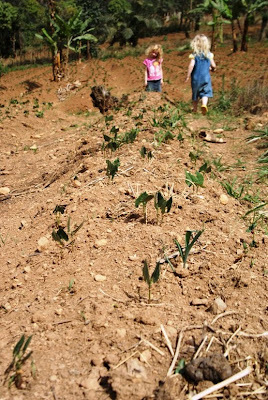 Everyone is planting which means the rainy season has arrived. 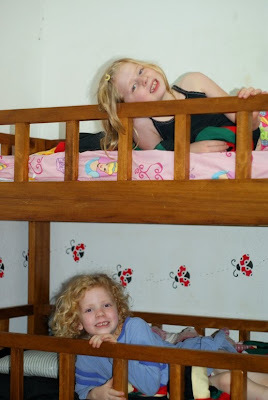 Here are Kate and Emma in their triple bunk bed. Because of the lense that was on the camera we couldn't squeeze in Faith Ann, but she is just below Emma. They love their bed...though sometimes it scares me. Faith Ann is not allowed to climb to the top. And nobody can be up top unless it is for sleeping. They aren't allowed to play. We did have a scare one night. The power went out and we didn't realize it, but the lantern ran out of kerosene too. Faith Ann started to cry (she is terrified of the dark) and then we heard a loud thud and a scream. I immediately recognized the cry as Kate's and so Ben and I jumped out of bed and ran down the hall. I was afraid of what we might find. Thankfully, she had been on her way down the ladder to go to the bathroom. The power went out, and b/c she was probably half asleep and it was suddenly dark, she fell. Her fall wasn't as far as we thought it was and all she got was some minor bruising. It took me a while to fall back asleep that night! Just another reminder of God's daily protection! Ok...now I'm back on schedule for my 365 blog posts. We had a great evening at church. This week is missions emphasis. We have guest speakers in on our Sundays, and Ben is preaching for the midweek services. Tonight we went through the great commission in Matthew. Poor Faith Ann smacked her head on the wood bench right at the closing of his message. I had to drag her out so her screams wouldn't disturb too much. Probably to no avail as our building is so small. She has a long thin bruise in the middle of her forehead. That girl keeps me on edge since her broken nose incident! After church I cheated and didn't make dinner. 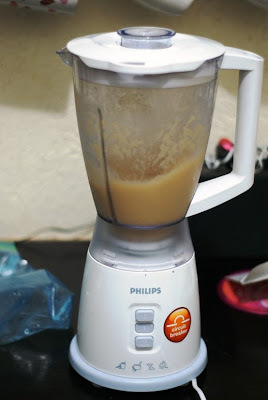 Instead I made what you see in the above pic...yummy banana/apple smoothies. Ben came up with this recipe and it is so yummy. You take a frozen banana (we try to keep some in the freezer), 1 cup of applejuice that is nice and cold and 10 ice cubes. When you blend it, it comes out so nice and thick! Like a shake! My wonderful mother-in-law gave me the money for Christmas to buy a blender and we have thoroughly enjoyed it! Thanks Mom!! Since my last blog post I have cleaned the kitchen...am slightly annoyed that I'm missing the cover to my tupperware pitcher. Hopefully it turns up. It isn't like I can just go buy a replacement...I'd have to wait til June, but the kids probably used it for some imaginary game. Now I'm finishing my post for today and will go fill a bucket to bathe. Another month or two and we should be able to take showers again. I can hardly wait! During devotions we got out our old college year books for some reason or another. 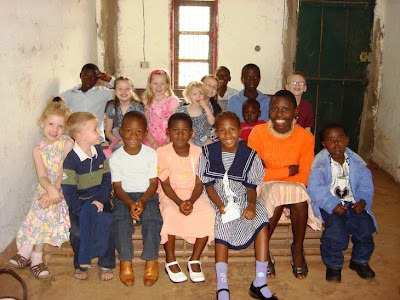 We had a lot of laughs to see if the kids could identify their mommy and daddy as well as their uncles and aunts too. 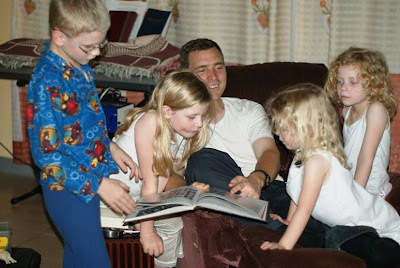 Here is a picture of them looking at one of the books. You can see that Ben is getting a kick out of it. Our pentacostal/presbyterian (not sure exactly what to call them) church was jamming and preaching loud enough to serenade us once again. I fell asleep to our wonderful fan, but unfortunately was woken up at about 5ish when the power went out. And yes...the service and music were still going strong and they must run their speakers on battery or generator. I guess this is just our Wednesday night curse. Very, very frustrating. A blessing though, is that, in spite of what our plumber told us, somehow we have been getting small amounts of water over the last few nights. Our reserve tank was about 3/4 full this morning. I'm so thankful for how God had blessed us with water. Every little bit helps! Well, I'll start working on post number two and hopefully stay on track again. I also made another post over on my digi scrapping blog if you want to check it out! Well...I'd like to think rainy season has arrived. It sure felt like it today. The sky rumbled and threatened all morning long, and finally it started pouring late afternoon and rained for a couple of hours. It was beautiful! It was so cool out and breezy. Ahhhhh...glorious. As you can see, Kate enjoyed it too! We started off the day with pancakes. I was up earlier than normal, so thought I'd treat the family to something nicer than cereal. Ben was off running around working on stuff for our landlady (she is doing a lot of repairs on the house) and so the kids pulled chairs into the kitchen and ate pancakes as I scooped them out of the frying pan. We enjoyed ourselves. The kids got a good jump on school and it was a full day of schoolwork. About noon, our landlady came for a visit to check up on all the work being done on the property. She lives about 2 hours away so doesn't come too often. She didn't stay long as she had a luncheon date with another friend nearby. I made lunch for the family and spent the afternoon studying for ladies Bible study while enjoying the sound of rain on my roof. Bible study is at 4 p.m. 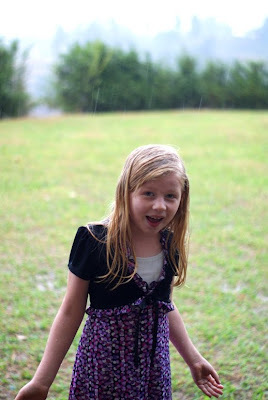 I waited until the rain stopped which ended up being around 4:30 and headed down to the church with Emma and Kate. As soon as we pulled in and parked, it started pouring again. I knew there would be no Bible study today. Everyone walks here and I knew they wouldn't be walking to church in that pouring rain. I waited until about 5 minutes to 5 and then drove home. We gathered the family together and headed to Yeiters for the evening. She invited all of the missionaries down to her house for a meal. The Needhams had some guests from the states, and Danny and Carrie came in from Foumban for some car repairs. It was a full house, but Susan did a great job cooking a lot of food and we all walked away stuffed. It was a full day as always here in Cameroon, but we are blessed. I hope your day went well too! Usually we go to town, but with Ben just having traveled all weekend, I suggested we stay home today. I figured he might want to relax. He spent most of the day writing a lengthy journal of his trip. He posted it on his facebook account here. He tried to set it up so anyone could view it. I hope it works. Maybe you can let us know in your comments to this post whether it was viewable by those that aren't his "friends" on facebook. I still want to go back and do a post for yesterday as I missed it and share some pictures and write some more about Sunday. When Ben got back into town last night, I just wanted to spend time with him, and sitting down to write on my blog was the last thing on my list. My mom got on to me today about it...saying how she was so disappointed when she got home from church. I was like, "good grief Mom...this was the first time I missed a post! Cut me some slack!" haha! Actually, I have missed before, but that was because of internet problems. Life happens! I got a lot accomplished today. I scoured my bathroom which was SO in need of a good cleaning. I did a lot of dishes. Made hamburgers with homemade buns for lunch. Swept and mopped my bathroom and bedroom. Put away a bunch of laundry. It was a profitable day. I will be very transparent and tell you about my down side of today. We called our plumber about our water situation, and he informed us that the spring that feeds our pipes is dry. He said they were trying to figure out a way to hook up a temporary pipe from another spring into our catchment so that we could get some water. Well, later tonight while I was doing dishes, or big reserve tank finally emptied too, so we have no more water. I will admit that water shortage is my biggest struggle here in Africa...and I haven't had to deal with it as much as some missionaries. I was reminded tonight, though, in our family memory verse that "My grace is sufficient for thee...for my strength is made perfect in weakness." It sounds so silly to be frustrated about water. Goodness! I have friends right now fighting for their life as they battle cancer! And here I am shedding a tear about water! There are people dying and going to hell and I'm complaining because I have to haul water from a bucket?? Sometimes I just need to sit and put things into perspective. Is it more of a burden and hassle? Yes. Definitely. But with an eternal perspective, my temporary water shortage is so trivial. Ok, enough sermon. 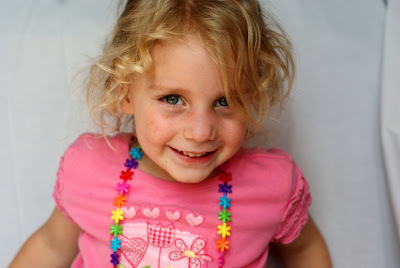 Here is a cute picture of Faith Ann. When she got up from her nap, she wanted to sit with Ben and I in the office. I gave her a piece of paper and a pen and she was trying to write letters and also drawing pictures. 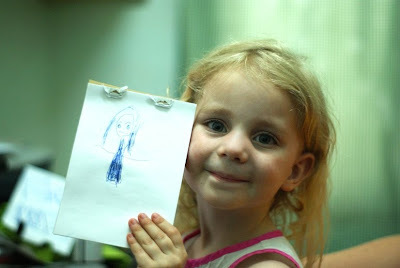 I am really impressed with her drawing skills. She does a pretty good job for a three year old! Before I close I want to say "Hi" to Emma in Lake Orion, MI. She wanted to know what time it is here in Africa. As I write this, Emma, it is 10:25 p.m. here and it is 3:25 p.m. where you live! Glad you read our blog and we have an Emma too!! I got a decent nights sleep, although I was woken up before 7. Not exactly my cup of tea for those that know me...especially on a Saturday. However, I was soon to learn that I fared better than Matt and Susan on the other end of the house. Oh boy! Those kids were up ALL night. I think one or the other ended getting up nearly every hour to yell at those kids to go to sleep. Faith Ann woke up when the power went out at 2 (she's afraid of the dark) and it set the ball rolling downhill from there. Someone announced at 5 something that it was time to get up...NOPE. And then there is me...blissfully unaware of all that was transpiring just a few yards down the hallway from me! :) We were invited to stay another night, but I thought it was in the best interest of the kids (and the parents...particularly Yeiters) to come home and sleep in our own beds. The kids were in bed at 8...and asleep shortly after. I know Yeiters are heading to bed early too. Next time we will separate Faith and Trinity. That was partly the problem. They obviously can't handle slumber parties too well! Besides the fiasco through the night, the kids had a fun day. They spent all morning playing outside. They came in and bathed (ahhhh...running water *sigh*), and ate lunch. The little ones went down for a nap and the big kids were told to quietly watch a movie. You could tell ALL the kids were tired though. Lots of whining and crying going on tonight. Hopefully they will be caught up by morning as Sundays are long, hot and tiring. So, I'm home. Have a TON of clean laundry (Thank you Susan!!!) and am ready to turn a fan on me (man it is crazy hot for the NW province) and crawl in bed and read til my eyes won't stay open anymore. It is only 9:30, so I should get a decent nights sleep! Tomorrow we go to church. I'll leave our car in town, parked at a store on commercial avenue, and when Ben comes in, he will get the car and come home! Pray for Ben's safety on his journey tomorrow! The kids miss him so badly! Emma was crying in bed last night b/c she missed her daddy! He will be glad to know that he is loved and missed! If you haven't checked out my new scrap blog...be sure to head over there when you get a chance. I have a link on the side of the blog. Have a great Sunday tomorrow! Kate helped me make tortilla chips today. I was reluctant to let her, but actually it made the process a lot faster. 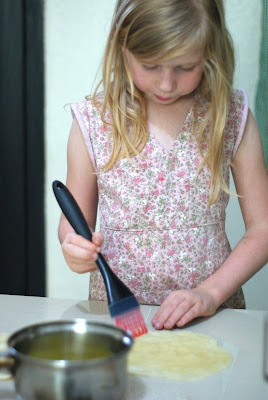 Sometimes having the kids help me slows things down, but she wanted to help so badly, I couldn't say no. I rarely make chips b/c it is such a time consuming job, but Susan invited us over again and I said I was making dinner since she has cooked for us that last two Fridays. So I made tortilla chips and nacho dip. Real healthy...I know. I ended up coming over after our nightwatchman, Michael, arrived, because all those men were still working on the roof and I couldn't leave with them still there. The kids had a blast as always, and Susan invited us to stay the night since Ben is gone to Benakuma. Even as I type this, the kids are still awake. I wonder if they'll get any sleep tonight. It is like one big slumber party going on in there. I'll close, so Susan and I can scrap some together. I do want to mention, however, that I started a new blog. This blog is totally scrapbooking related, so head on over to www.digi-scrap-aholic.blogspot.com and check it out. I'll post some of my scrapbooking pages from time to time and hopefully some tutorials for those that are interested in learning how to scrapbook digitally. If you stop by, be sure to leave a comment so I know you were there! Another noisy, hot day at the Sinclair house and another 1/3rd of the roof done. This section was over our bedrooms, so I'm glad they got finished today. And I also want to mention that my new fan is......Ahhhh, bliss. I actually slept like a baby in my own bed on a Wednesday night! The Bambui preacher was louder than ever last night...but thanks to that fan, I didn't even notice. Other than all the roof work, nothing eventful took place today. The kids did their school. I laid the smaller girls down for a nap, and amazingly enough, Faith Ann actually fell asleep! You should have heard the racket. I was suprised! Ben said he had a hard time waking her up! We went to church and had a good crowd there. 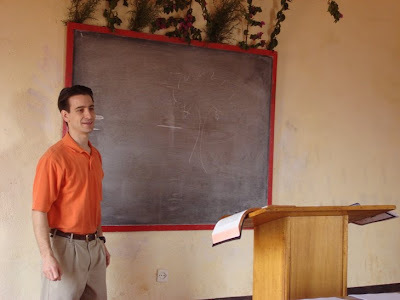 Matt has been teaching how to study your Bible. It has been very practical and I know the church members have been enjoying it. We came home and I made some tortillas and threw together some quesadillas. With my tortilla press, it goes so much quicker than rolling by hand. I had some homemade salsa and also whipped up some sour cream. It ended up being a decent dinner for a Thursday night even though we ate pretty late. We usually eat late on Thurs. because we don't get home until about 6:30. Ben leaves tomorrow to spend three days in the village of Benakuma. I will hate to be without him for that long, but he has been looking forward to this trip. He told me that he will end up traveling a chunk of the way in a Land Cruiser taxi. TomMike told him that they usually carry about 35 people! 35 people in a Land Cruiser!! Well, not just "IN" a Land Cruiser. From what Ben was told, you want to be the one traveling Outside the Land Cruiser on the bumper, or side runners, or even the roof, b/c the inside is too hot and stuffy. I can't wait to see the pictures he gets from this trip. Please pray for his safety! Well, I have a pile of dishes awaiting me. I will turn on some music and enjoy the smell of my queen of the night bush, which is blooming again. G'night!! Oh man...isn't she cute!! I needed some pics for another CT layout I'm working on for a friday product release, so Faith Ann and I had a little photo shoot. She loves having her picture taken! Today was busy, noisy, and dirty at the Sinclair house. 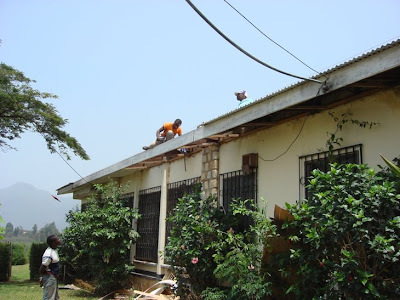 It seems that the 11 day stretch of rain is over until the actual rainy season begins (hopefully by the 15th) and so a big crew of guys came and tore 1/3rd of our roof off. It was a day full of banging, sawing and scraping...and also shattering glass (oops!). But, they managed to get all the new zinc on the part that they tore off, so even if the rains did happen to come, we would stay dry. Tomorrow they are back at it for another portion of the roof. I'll be happy when they are finished, and that broken glass is temporarily covered with a garbage bag and duct tape! The roof is as old as Ben and I are and in bad need of replacement. Our landlady recently sold some property so had the money to replace it. It will be so nice not having to set out buckets to catch the leaks this rainy season. Another highlight of my day is the fact that Ben came home with a big, noisy, powerful fan, that hopefully will drown out the noise of our crazy Bambui preacher that keeps us up til the crack of dawn EVERY Wednesday night! This is Drew's routine every morning before breakfast and every night before bed. 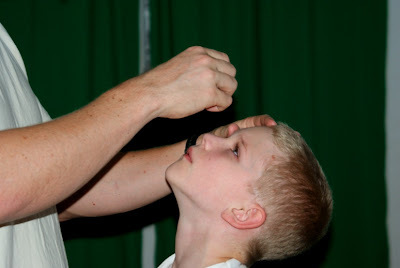 He has to have his drops to regulate the pressure in his eyes. He says they sting , but never really complains about the routine. He is so good natured. Ben and I were just talking and agreeing that they don't come much easier than him. He just rarely gives us trouble, is always quick to obey, happy-go-lucky. I mean, he is human and does have a sin nature, but overall, Drew is a good kid. I'm SO thankful for him! I've gotten so many comments about my blog since we announced it in one of our recent prayer letters. I'm SO glad you all are following and reading! As I take my picture a day for my 365 project and journal about our daily life in Cameroon...I really hope it will give you a picture of the fact that we are just your average every day people, serving the Lord in a different part of the world. People often make too much of missionaries. Put them up on a pedestal and that is not where we belong. God has placed us each in different corners of the harvest field, but that doesn't make one job more important over the other. The important thing is that we as believers are serving and ultimately bringing glory to God through our service to Him (I Cor. 10:31). Ben was out of the house early today and had a full day before I even dragged myself out of bed. He taught moral instruction classes in two schools, headed to town to the printer to get a gospel tract printed (with the theme of the world cup since Cameroon is in the World Cup this year), and then went to get the proper invitation documents stamped for Pastor Lee Atkinson who is coming to visit us at the end of this month. Whew! Busy morning! On the home front, I woke up at about 7:30 feeling quite ill. I opened my door and told the kids they could get up, but to fend for themselves for breakfast. I was going back to bed. The kids were asking immediately, "Do we have to do school?" I said, "No, I can't supervise school. 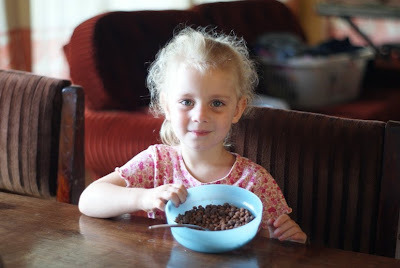 Get some breakfast and watch a video quietly so I can sleep." I hear Kate, "Emma did you hear that, Mommy is sick ... so we can watch a movie!" No sympathy around here for me. They were very good though. They came in a bit later and asked me, "Can we have cookies for breakfast?" I mumbled an "uh-huh" and they were out the bedroom door again. They sure enjoyed their Monday! Faith came crying at one point, "Mommy, I'm thirsty." I immediately heard Kate shushing her and telling her that she would get her a drink. I really do have good kids. That was so thoughtful of Kate. I saw in that instant that she doesn't always think of herself. I finally woke up at 10:30 and the kids had been so quiet I actually slept quite hard. I still have no idea what that little bout of stomach trouble was, but I felt much better once I got up. After I bathed (cup and a bucket of course) I got the kids all working to clean up the parlor while I tackled the big pile of dishes. We managed to get it mostly cleaned up before Daddy got home and then we headed to our restaurant. I didn't eat too much, but we enjoyed being together for some family time. Our afternoon was relaxing. We got another heavy rain storm tonight, and now I'm off to bed. Here is my picture for the day. Hillary comes and watches our house every Monday and this is his bike. 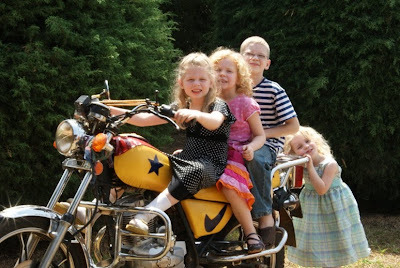 The kids were having a lot of fun pretending to drive all over the continent on this thing this morning.